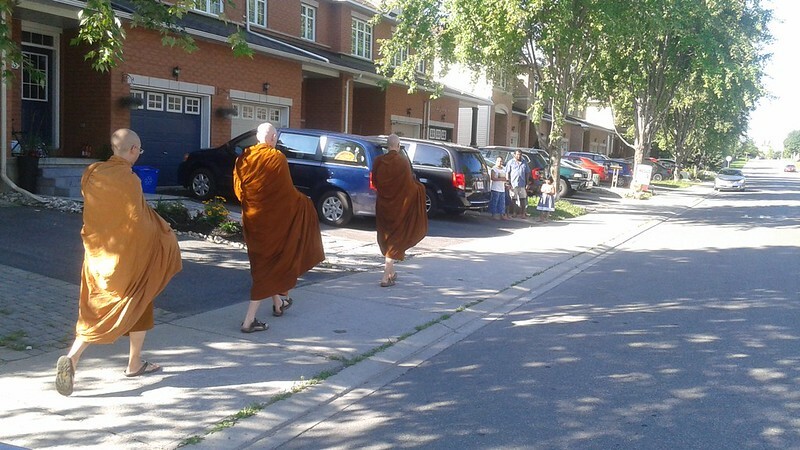 Two weeks ago, the monks from Tisarana Buddhist Monastery have started alms rounds in the Barrhaven suburban neighbourhood of Ottawa, Ontario. The above photos were from Sunday, August 12, 2018. 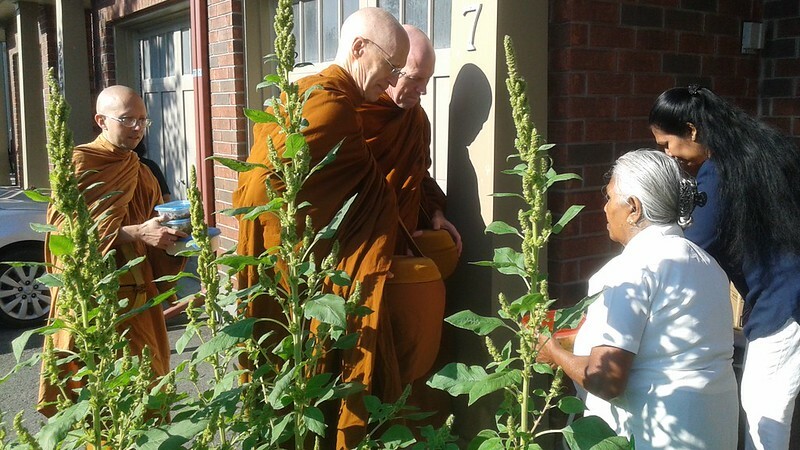 For over 2,600 years, Buddhist monastics have traditionally went on daily alms round (piṇḍapāta) to collect food. The Buddha established this practice to allow his monastic disciples to obtain their daily sustenance through the generosity of lay people. The tradition continues in many traditional Buddhist countries such as Thailand, Burma and Sri Lanka. The forest masters of Thailand, include Ajahn Chah, made alms round a centerpiece of the daily monastic schedule. Since the late ’70s, as monasteries in the Ajahn Chah tradition became established in the west. There was strong interest in keeping the alms round tradition alive. 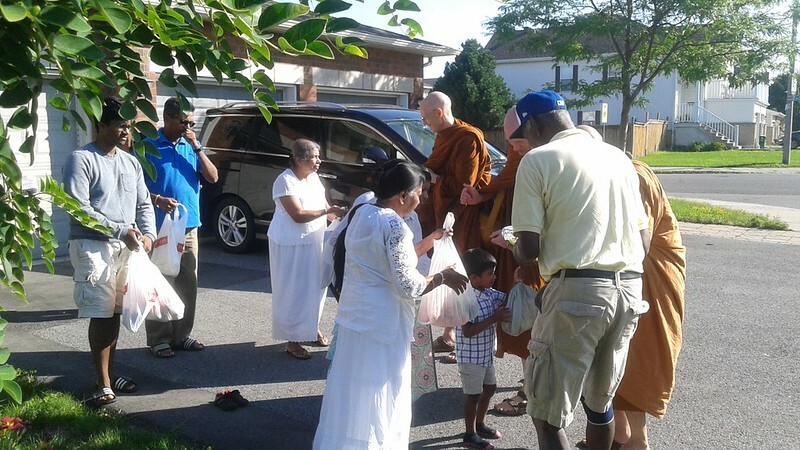 In many ways, maintaining this alms round tradition in new cultures has been successful. For example, the monks at the Pacific Hermitage, located in southern Washington, go on alms every day to the nearby town of White Salmon. The monks at Temple Forest Monastery, located in New Hampshire, go on alms round twice per week and the monks at Abhayagiri, located in northern California, go on alms round once per week. However, other monasteries, including Tisarana, have faced many challenges in establishing alms rounds due to a variety of factors. 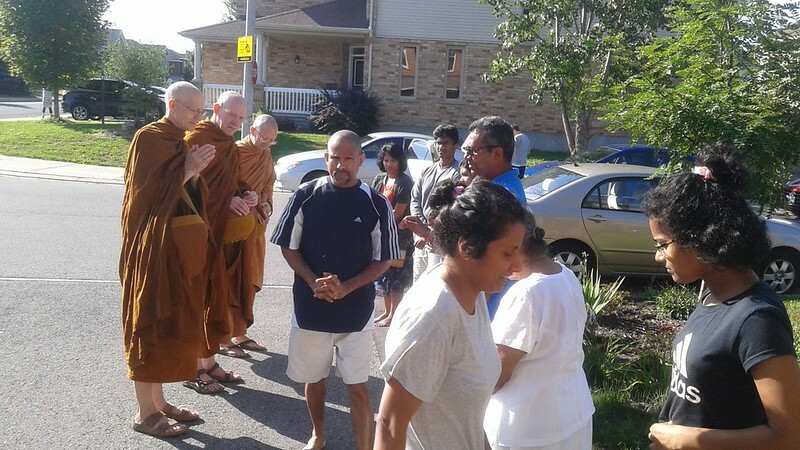 Last month, during a discussion with the community at Tisarana, lay supporters from the Barrhaven area of Ottawa invited the monks at Tisarana to go on alms round in their neighborhood. 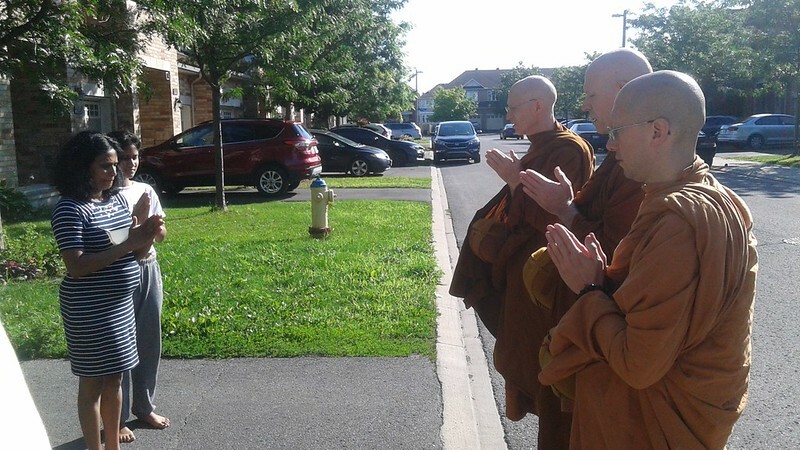 Ajahn Viradhammo offered his approval for restarting this new alms round, allowing the monks to go every Sunday morning as to continue as long as weather permits. He said that it would be a great opportunity for monastics and the wider lay community to reconnect, and to create a wider awareness of the monastic tradition within the area. In the mean time, if you want to find out more information, including the routes and times the monks will be making each Sunday morning, please contact monastery office by using our contact form.